His parents came from Jamaica, but they died, and he grew up in an orphanage in Detroit. In the public school, he came up with Paul Chambers and Donald Byrd. "A very good school of music," remembers Curtis, "also some of the older musicians, like Tommy Flanagan, Thad Jones and Milt Jackson—quite a good crowd! That had a lot to do with me becoming a jazz player; I didn’t do it on my own. I sort of got caught up into the spirit of things, and wherever they directed me, that’s the way I went." He first picked a violin, which he didn’t do too well with, and, ironically, the started playing trombone. He ended up studying with J. J. Johnson, and had a lot of help from Frank Rosolino. Another teacher was Elmer James, who was the bass trombonist with the Detroit Symphony. When he went into the Service, first he was in the Tank Corps, then he found Cannonball Adderley who was the head of the Army band, and Adderley got Curtis into that band, where Junior Mance, Nat Adderley and Paul Chambers were also swingin' and marchin'. When Fuller returned home, he began working with Yusef Lateef's quintet. The Lateef quintet came to New York in April 1957 to record two albums for Savoy and a third produced by Dizzy Gillespie for Verve. Then Fuller met John Coltrane. "Meeting Trane was the greatest thing that ever happened to me," says Fuller, " It was Miles Davis who took me to New York, and Coltrane was in the band, as well as Paul Chambers, Philly Jo Jones. Trane took me aside, and, of course, we did Blue Train, which was my first album—and that started everything. He had confidence that I didn’t have; he saw something that I didn’t see. A great man. Yes, he had a very spiritual quality—I wish God would reach down and touch me the same way one day. He tried to steer me the right way, but I was a little reckless; I didn’t comprehend at the time—I was still chasing girls, and the whole bit. Trane was giving me a message; unfortunately, I didn’t get it fast enough." Fuller started recording for Blue Note (which I'll discuss later). At the end of 1958, Benny Golson asked Curtis to share the front line for a Riverside blowing date entitled The Other Side Of Benny Golson, which put the emphasis on Benny's tenor playing rather than his composing and arranging. The chemistry between these two hornmen clicked, and they would record an album under Curtis's name for Savoy [Blues-ette, his unquestionable masterpiece] and three under Benny's name for Prestige in 1959 with various rhythm sections. They also made two Fuller albums for Savoy with trumpet added to the front line, which laid the groundwork for the creation of the Jazztet. All Savoy recordings are now available on CD. In the summer of '61, Curtis made Art Blakey's Jazz Messengers a sextet for the first time. He stayed with the Jazz Messengers until February 1965. He spent the rest of that decade freelancing around New York, adding his beautiful sound to a number of Blue Note dates such as Lee Morgan's Tom Cat, Hank Mobley's A Caddy For Daddy, Joe Henderson's Mode For Joe and Wayne Shorter's Schizophrenia. Though he is more relax in combos, he had been with big bands, too, including Dizzy Gillespie, Gil Evans, Maynard Ferguson, Lionel Hampton, and even a small stint with Duke Ellington. Curtis is still active. This year, I Will Tell Her, a new album (a double-CD set) of Fuller's recent recordings with a sextet of some Denver friends, released. One CD is done in the studio, the other in live concert performance. "A chock-full of spirit, and comes easily record," wrote Michael G. Nastos about it. 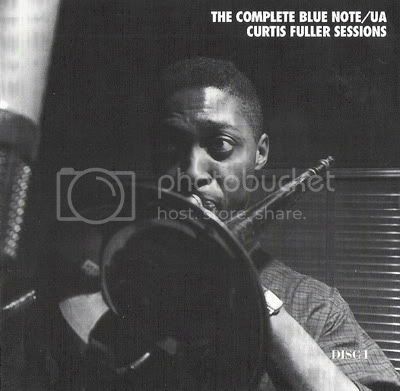 It's been two weeks of enormous enjoyment since I'm listening to Mosaic's Complete Blue Note/UA Curtis Fuller Sessions, unfortunately now an out of print set. The mosaic set starts with Fuller's 1957 session for Blue Note, a crucial year in Fuller's long career. 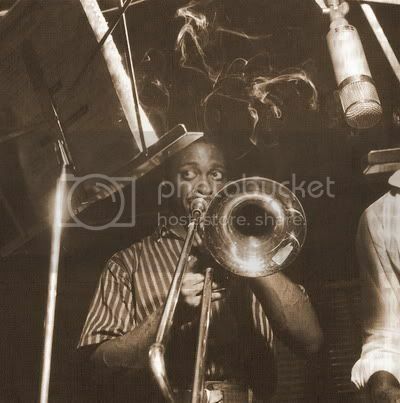 In that very same year he appeared in Blue Train and a Down Beat poll selected him as the new star of trombone. Alfred Lion had also heard about Fuller and went to see him at the Cafe Bohemia with Miles Davis's sextet. Curtis joined the Blue Note family, appearing on a Clifford Jordan date on June 2 and making his own, The Opener, with Hank Mobley, on June 16. 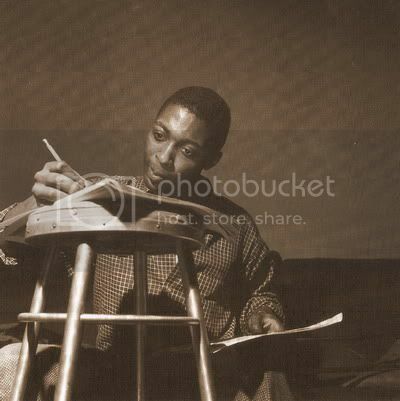 After eight months in New York, Curtis Fuller had made six albums as a leader and appeared on 15 others (beside The Opener, Bone And Bari and Curtis Fuller-Art Farmer are among those). Even in those prolific times, that's pretty impressive for a newly-arrived trombonist. All those albums were "brimming with melodic advances and Fuller's rich, brilliant sound, so unusual for an instrument that in the wrong hands can be dull and plodding. This is music with a confident stride to match the big city's beat and the swift intelligence to master its special rules," as Michael Cuscuna explains in his extensive liner notes for Mosaic set. It worth mentioning that the fourth Blue Note album from this set, Two Bones, features Slide Hampton, was never released in the U.S. (or anywhere in the world except briefly in Japan during the late '70s). Also included is a 1959 United Artists date originally called Slidin' Easy, with Lee Morgan and Hank Mobley. Rhythm sections throughout included pianists Bobby Timmons, Sonny Clark and Tommy Flanagan, bassists George Tucker and Paul Chambers, and drummers Louis Hayes, Charlie Persip, Arthur Taylor and Elvin Jones. Once Gigi Gryce said about Fuller: "he has buckets and buckets and tons of soul. He has wonderful natural qualities and is bound to mature into a very important voice." The Mosaic set was a perfect embodiment of this statement and other statements that emphasis on Fuller's endless ability to move you with one of the most hard-to-blow instruments of jazz. All Fuller quotations from an interview conducted by Les Tomkins, 1976.